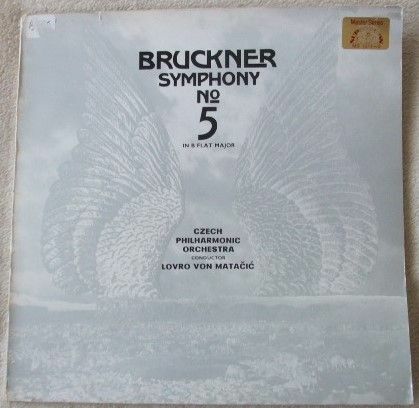 33rpm Double LP Record of MS 1211-2 Bruckner SYMPHONY NO 5 in B flat major, featuring the Czech Philharmonic Orchestra conducted by Lovro Von Matacic. It was issued on the stereo blue and silver Supraphon label in 1972. Czech pressing. The records themselves are graded better than excellent, with no visible surface marks or scratches when viewed under normal house lighting. Excellent sound quality, with NO jumps, repetitive ticks or crackle and no more than a very isolated pop (about one per side). Otherwise more or less faultless playback. Minimal to no spindle wear. Labels very clean. Very light spider marks. The gatefold sleeve is graded very good, with some light wear (one inch tear to bottom of spine, a couple of thumbnail closed tears, bumping to corners, small sticker to front cover, nothing at all drastic). The spine is intact and pretty strong, with a couple of 'cracks' cutting through two of the letters. Again, nothing at all drastic. The inner sleeves have no wear to speak of.